The apple is a special ingredient for French pastry as it is the star of the classic tarte tatin and the recipe for this week, the apple band tart. In the Bouchon Bakery cookbook the tart is made extra decadent with the addition of pastry cream between the flaky crust and fanned apples. No scoop of vanilla ice cream needed here, unless you feel like indulging. For this tart, I first made the pastry cream a day before I planned to bake the tart. Even though I've made it before, this time was different. I used custard powder for the first time, and the pastry cream turned out super yellow (which was noted in the book), and extremely thick. So thick, I couldn't get it through a sieve to strain it. It was almost like Jello. I wasn't sure if I cooked it for too long or if it was a result of the custard powder. After asking Leticia and doing some internet research, I learned it was the custard powder. Before using the pastry cream, I added about 1/4 cup of milk and beat it in my mixer until it was smooth and workable. I find it hard to believe that such a small difference in ingredients would make such a huge difference in result. Also, the pastry cream recipe makes way more than I needed for this recipe, so now I have to think of something else to use it for asap. A bit inconvenient. Moving along, I cheated a bit with this tart. I used store bought frozen puff pastry instead of making my own. I figured I'd leave that until the appropriate chapter. I rolled out the pate sucrée and puff pastry, to about 14 inches long. The assembly was simple, but took some time to layer the apples in the tart. I didn't exactly understand the directions for fanning out the apples, but I made sure they overlapped and looked pretty. I couldn't chill the tart in the freezer before baking, because my freezer is so tiny, it doesn't fit a half sheet pan. So I just put it in the fridge instead. After baking, the tart looked and smelled amazing! I let it cool for a bit, then sliced off the ends for me and my husband to try. Yum! He agreed that it was super tasty, and I had to prevent him from eating more so I could take photos! 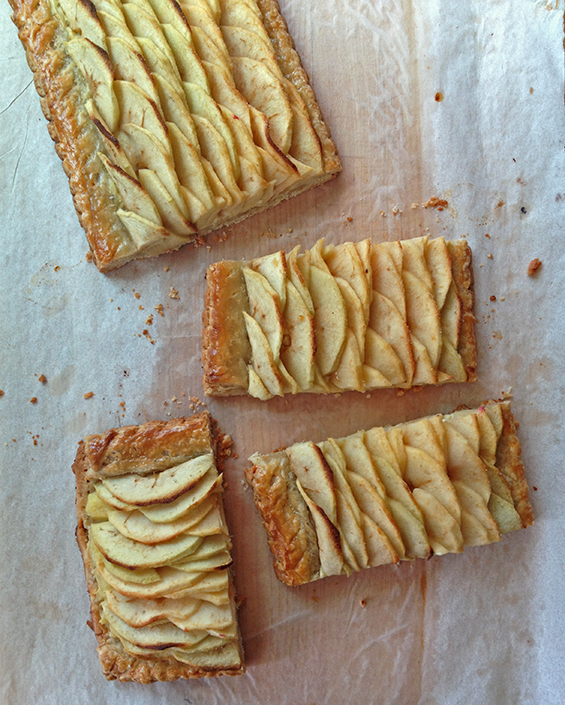 The tart is so beautiful and placing the apple slices one by one into rows was actually a very relaxing activity. I used a combination of Granny Smith and Pink Lady apples. For the pastry cream, the small batch recipe makes a very large quantity so I made 1/3 the recipe. I'm sure breaking it down that much probably throws off the overall outcome but I gave it a try. I paired the tart with a creme fraiche ice cream so the sweet and tangy combination was really nice. The tart on its own I thought was a little dry. As I mentioned above it could be because of my pastry cream adjustment. The apples were tender and were given a nice boost of flavor from the brown sugar butter glazed on top just before going in the oven. After the tart came out though the apples looked a little unfinished so I think another glazing of that mixture would help them glisten. 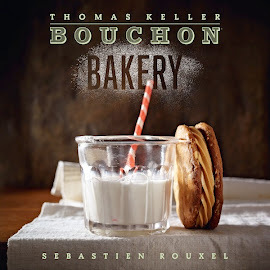 I have had this cookbook since its debut but have been too intimidated to actually bake anything because the recipes are about 500 pages each :) After baking the apple band tart I realized they are actually pretty darn simple. This recipe came together in no time. All of the components were easy enough to make. However, I didn't have an almond flour so I used extra APF. So the taste? It was good. Not quite sweet enough for my taste. I will add extra brown sugar next time. Plus, my pate sucree browned a little too much for my liking. Next time I will freeze the pate sucree overnight, add on the puff pastry, pastry cream, apples, freeze for an hour or so, top with extra brown sugar and bake. And I will try again. Maybe I should have bought the almond flour :) The best part of this recipe is that is makes enough for two. So you can bake two now or save and freeze for later. Plus, it's quite beautiful.